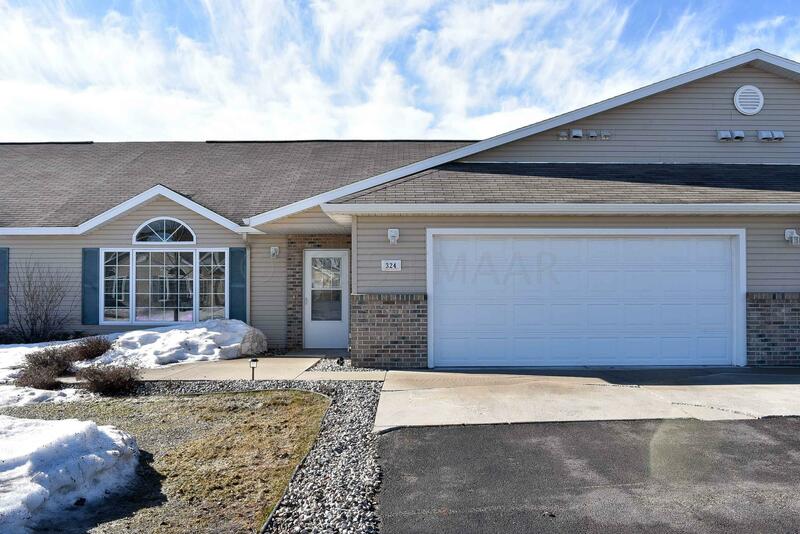 Run, don't walk to this two-bedroom, two-bath '55 Plus' one level townhome in North Moorhead! Stunning from the moment you walk in, the tall cathedral ceilings, new carpet hiding the in-floor heat, fresh paint and natural light bathes the unbelievable spacious open floor plan! A huge pantry compliments the large kitchen and all appliances included. A light & bright sunroom surprises with its large windows and proximity to a small, private yard. A good sized laundry room with washer and dryer, main large bathroom, guest bedroom with a walk-in closet. The master bedroom is huge, with an another unbelievable walk-in closet and and a spacious bathroom compliment the space. The two-stall, finished garage with openers. Don't worry about shoveling snow or lawn care because it's done for you! A gorgeous and immaculate '55 Plus' two-bedroom, two-bath townhome in North Moorhead with nary a stair in sight, should bring you running to make an offer! This beautiful, single level, rambler style townhome has all the advantages of home ownership with none of the upkeep! Drive up to this meticulously cared for beauty which lies in a quiet cul-de-sac, surrounded by a community of fifty-five and older homeowners. Snow removal, lawn care and exterior insurance are taken care of by the low HOA fee. Once inside, hang your coat in an oversized coat closet and be drenched in natural light from the huge picture window which glows throughout. Cathedral ceilings and an open floor plan emphasize the spacious living room, dining room and kitchen - complimented with a huge pantry - all beautifully decorated and maintained. New carpet never gives away there are heated floors underneath your feet! Through the kitchen, discover a beautiful, carpeted sunroom with plenty of space for your TV and recliners! The sunroom also exits to a private a patio! Through the hallway, a large and immaculate laundry room and forced air furnace provide all the conveniences of a large home - especially with the washer and dryer! Lots of storage in the beautifully maintained bathroom make its proximity to a very large guest bedroom with its own walk-in closet, a space you've dreamed about. The master bedroom is huge and beautifully maintained and decorated, with plenty of space for a reading nook or chairs for TV watching! The walk-in closet is unbelievably spacious - with practically enough room for another bed! An ensuite bathroom make the master suite truly your own private spa! A finished & insulated, oversized two-stall garage with a water supply and plenty of room for additional storage and automatic door openers, really make this the dream home you've been searching for. If you are tired of snow shoveling and lawn mowing and would love to sit back and enjoy life to the fullest, in a beautiful, immaculate one-floor '55 Plus' townhome, you need to hurry to this once in a lifetime gem!